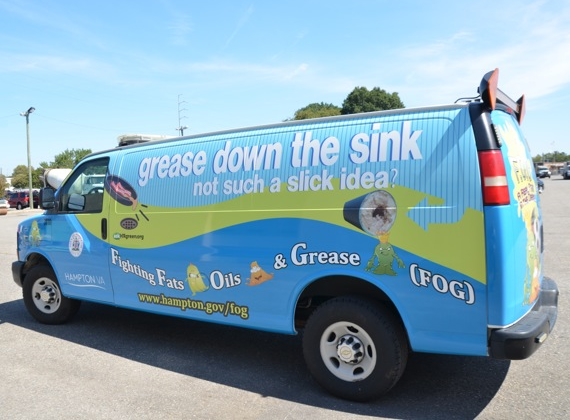 Fats, oils, and grease cool and stick to the sides of sewer pipes when poured down the drain causing backups in homes and businesses and sewer overflows in streets. The Department of Environmental Quality has mandated the FOG Program as a means of improving the quality of our local waterways. The program consists of education for residents and commercial food service establishments and a Fats, Oils, and Grease Ordinance. In addition to the mandate, taking care of our sewer system is just a good thing to do. It helps the Public Works Department keep costs down, work efficiently, and protect our creeks, rivers, and bay. It also keeps plumbing costs down for individuals. All food service establishments (restaurants, daycares, churches, etc.) must register for the FOG Program. Complete our online registration and you'll be contacted to schedule an educational visit and compliance inspection in your facility.